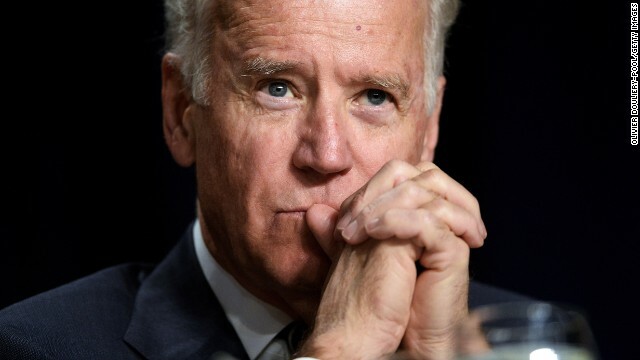 (CNN) – Vice President Joe Biden blasted China on Wednesday in a speech about foreign policy, arguing the country hasn't produced anything innovative. "China-and it's true - is graduating six to eight times as many scientists and engineers as we have. But I challenge you, name me one innovative project, one innovative change, one innovative product that has come out of China," the vice president said forcefully. His comments came in a commencement ceremony at the U.S. Air Force Academy in Colorado Springs. The vice president stressed that the country's record on human rights has stymied its progress on other fronts, like innovation. Biden recalled that during the 90s, there was growing concern Japan would become a major threat and economic competitor–"that Japan was the future," he said. Then, he said, people started saying the same thing about China. That's when he made his remark that even though China is producing more scientists, they aren't producing innovative products. "And I want Japan to succeed as I do China," he continued. "But give me a break." The vice president has argued in the past that China struggles with innovation. When he visited the country in December, he urged young students at the U.S. Embassy in Beijing to challenge the status quo, saying "innovation can only occur where you can breathe free." It's an argument he has brought to Chinese President Xi Jinping, as well. "Everyone who made their way to America in the first instance came because their human rights were not being totally valued," Biden said he told the Chinese president. "It's stamped into the DNA of America." He has also talked about what he sees as a lack of Chinese innovation during trips to Iowa in 2012. At Iowa State University, he told students that China is "not innovating." Other themes from Biden's speech Wednesday echoed President Obama's same-day address on foreign policy at the U.S. Military Academy at West Point. As the combat mission in Afghanistan comes to a close, Biden told the graduates that they're still entering a world of obstacles. "As we end an era of war, your mission may be different, but you will face challenges no less formidable and complex. Your work will be every bit as vital and we badly need you," he said. "The poet Thoreau said, 'A bluebird carries the whole sky on his back.' Well you are Falcons, and you carry America on your back," he continued. "You carry America on your back. And America will have your back forever." Poison toothpaste and the self-collapsing crib!!! Innovation!!! Even the slave labor isn't an innovation....and given our country's history, it's of no surprise that our corporations love it to death. Ahhhh hey Crazy Joe, don't go ticking off and insulting the country that is financing Obama's massive yearly deficits. I can't believe this guy is VP. It is scary to think if anything happened to Obama, this nit wit is next in line. I think Joe Biden is trying to tick the Chinese off so they don't fund Hillary's campaign like they funded Bill's. Joe, you sly devil you! Unless, of course, you need treatment at a VA facility. Then, not so much. They don't have to innovate.......they get to make everything anyway. Sarah palin/John mccain would have been awesome choices to run this country? no republican politician has Joe biden's credentials, and what is more scary is a republican becoming president. Joe , please don't run for President . And please don;t type cast people into there Nationalistic regions using race . by doing so your discrediting what america stands for , for all people . Don't feed Nationalism , not in China , not in Russia , it's dangerous . When America has a high speed rail train , let me know . If we here in the US would keep the patents and secure our intellectual property (keep it from being hacked and taken as an example) and not sell for the short term profit, then we would be much better off. We need to do the research and keep the technology here and only sell parts of it as a finished product. Right because the gop would never choose China over the USA, oh waif a minute, never mind, they are pumping big money into Republican superpacs, more jobs to China, the gop promised jobs and there they go. Don't buy any stuff Mede outside of USA. American Made goods to reduce prices too. modern E-Cig is invented in China. The current world's lighest material are invented in China. That's already two Joe. Being ignorant as commenters are understable, but on a presidential level however, is not. Do you really think the Chinese food you get at your local take out is what they are eating in China? That is Chinese food with an American twist. I'm not surprised you'd knock our VPOTUS. It's what the GOP does best: bloviate. Maybe it is time you all calm the bleep down and get over that Barack Hussein Obama is POTUS.